It’s Saturday, and we’re on week away from the return of Doctor Who from BBC America. I’ve spent the last three weeks reposting my reviews of the season’s first half, originally aired earlier this summer, and today, we complete that journey with a re-post of my original review for A Good Man Goes to War, the wonderful mid-season finale that has left fans hungry for more for the past few months. Come back next Wednesday for a special retrospective feature, and next Saturday for my review of the new episode! As the first half of Doctor Who’s sixth series draws to a close (the second half airs this Fall), the biggest revelation is not the scope of the Doctor’s plan to rescue Amy, nor how his enemies’ machinations ultimately nullify his efforts. In my mind, the biggest surprise isn’t even the identity of River Song, finally revealed after years of speculation. No, the biggest shock this mid-series finale has to offer is that the story we all thought we were seeing was, and has been for quite some time, something else entirely. Steven Moffat has been playing a long con on us for the last seven episodes, because this season is not – as it may have initially appeared to be – a story about the continuing adventures of the Doctor, Amy, and Rory. It’s not the Doctor’s story this time, no matter how much he may factor into things, and it’s not the tale of him taking on a big enemy like The Silence. It’s not even Amy and Rory’s story. It’s the story of River Song, and it has been from the earliest moments of the season. The confirmation that River is indeed Amy and Rory’s daughter, Melody Pond (which I first predicted in my review of the season’s second episode), recolors much of what we’ve seen over the past seven episodes. 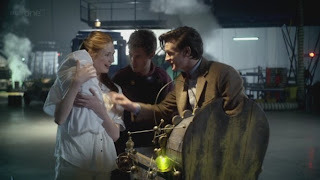 All of this season’s major villains have been conspiring to capture her as a baby in order to turn her into a weapon to use against the Doctor, and every action the Doctor has taken ultimately leads him to the moment at the end of the episode where he leaves Amy and Rory behind to go meet River Song for the first time. It’s a moment the show has been building to since River was first introduced in the fourth series (back when David Tennant was the Doctor) – the moment when River first meets the Doctor, and their strange, chronologically jumbled relationship begins. We didn’t know it until tonight, but that’s what all of series six has been about; creating the scenario wherein the Doctor has to rush off and begin this new adventure with River. Alex Kingston may only have appeared in three episodes so far, but series six has been about her character from the beginning; it’s just that, like the Doctor and River’s relationship, we’ve been given this story out of order. From a chronological viewpoint, the villains we saw tonight – led by Madame Kovarian, formerly known as ‘Eye-Patch Lady’ – started the effort to control River Song even before she was born. They kidnapped Amy and replaced her with a Ganger before the season even started so that they could manipulate the baby’s DNA in utero, bringing out the Time Lord side of her in order to one day use the child as a weapon against the Doctor. They will succeed in this goal, as we already know; once River is a few years older, she’ll be imprisoned in the Astronaut suit by the Silence, and the Doctor will let her kill him. The season started with River, this half of it has ended with River, and even though the characters and the audience didn’t know it, a lot of what happened in the middle was about the battle for baby-River across all of time and space. In short, this half of the season was the story of River’s most unusual birth. What makes the cliffhanger so exciting, then, is the promise of seeing the second half of this story, where River will truly take center stage. When the Doctor gleefully jumps in the TARDIS at the end of the hour, he’s embarking on the part of the story we’ve been waiting to see since River’s introduction – her time as the Doctor’s companion. 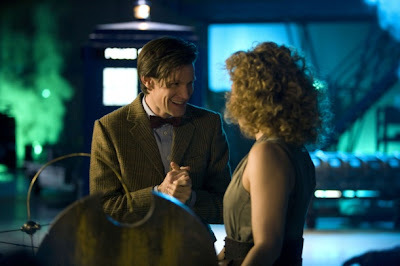 In The Impossible Astronaut, River told Rory that the Doctor met her when she was very young, and knew everything about her, a moment this whole season has been building up to. Of course, there have been surprises along the way – River is a new breed of Time Lord, and she and the Doctor will indeed have a romantic relationship. That makes Amy and Rory the Doctor’s in-laws, in a strange, timey-wimey sort of way. Given all these revelations, and what we know about the Doctor and River from seasons past, this is easily one of the most invigorating cliffhangers the revived Doctor Who has ever given us. It’s my favorite kind of cliffhanger, too; it’s not the cheap kind of shock ending where everyone is in peril and their lives are on the line. Those twists work on a week-to-week basis, but when leaving the air for a long stretch of time, the best kinds of cliffhangers are the ones that introduce an exciting new status quo, and that’s certainly what we got here. Once the show returns in September, I suspect we won’t see much of Amy and Rory – the ending made it very clear that the Doctor is off to go begin his adventures with River, and that means he won’t be seeing the Ponds for quite some time. In fact, I’m confident that the Doctor won’t see them again for two-hundred years, at the point where he invites the Ponds, grown-up River, and his past self to witness his own death; in short, the events depicted in the premiere. If you watch The Impossible Astronaut again, you’ll see that the 1100 year old Doctor greets the Ponds much more exuberantly (as though he hasn’t seen them in a long time) then does the 900 year old Doctor, who presumably hasn’t been away that long. In any case, the adventures the Doctor has with River in upcoming episodes will certainly inform his decision to let himself die at young River’s hands; we now know it was indeed Melody Pond in the astronaut suit. A Good Man Goes to War had a definite Star Wars vibe to it, and I’m wondering if the Doctor’s decision to let himself die will be a sort of Obi-Wan-esque “If you strike me down, I shall become more powerful than you can possibly imagine” choice, a sacrifice to save and empower his friends. What exactly lies in the Doctor’s future – and River’s past – that brings him to this moment has yet to be seen, but there are so many wonderful possibilities open at the end of A Good Man Goes to War that I can safely say I’ve rarely, if ever, been so excited to see the next part of the story. But enough looking ahead – as fun as it is to talk about the last five minutes of the episode, it would be criminal to ignore the rest of the hour. War wasn’t perfect, but it had plenty to offer, and it wasn’t just the final revelation that got the imagination working. Steven Moffat, after all, has a bigger imagination than most, as he’s proven time and time again. Some, myself included, would call his endless creativity genius, and tonight’s episode – along with the rest of the season thus far – has been another excellent showcase for the man’s intellect. Yet as much as I loved this episode, I’d also have to rank it on the lower end of the hours Moffat has penned. He’s written so many masterpieces, like Blink or A Christmas Carol, that it was likely impossible to keep that streak going forever. War was not a masterpiece, and by and large, it wasn’t quite on the level we’ve come to expect from Moffat; some of that is the simple fact that we’ve been spoiled by episodes most writers would kill to call their own, but I also think Moffat’s imagination got the better of him during parts of tonight’s episode. For once, his execution of the story couldn’t quite match up to his ambitions. The same extends to Madame Kovarian; Frances Barber is effectively creepy in the role, but we still have no explanation about her allegiances or vendetta against the Doctor. Again, I’m sure we’ll learn the details later on, but since the episode’s story hinged so strongly on the Doctor’s rage over what his enemies have done to him, it would have been nice to understand those enemies a little bit better. We learn a lot about River Song in this episode, and how Kovarian’s ultimate goal is to turn little Melody Pond into a weapon to use against the Doctor, but we never discover why Kovarian wants this to happen, who she’s working with and/or for, or why she could convince the Clerics to help her out. Those seem like essential components to this section of the story, and stretches of the episode felt a bit hollow without that extra information. When Rory visits River near the beginning of the episode, she tells him that the battle of Demon’s Run is “the Doctor’s darkest hour. He’ll rise higher than ever before and then fall so much further.” After first seeing the battle, it felt like hyperbole had gotten the better of River. Was this really the Doctor’s greatest triumph, or, subsequently, his darkest hour? Couldn’t there surely be better examples of victory and downfall in the many decades Doctor Who has been on the air? And he does indeed fall much further. The Doctor is tricked in every possible way, and that’s a huge blow to his ego; yet it’s the fallout from the trap that hurts the Doctor the most, because it destroys those around him. Those he called in for help, like the Sontaran or Dorium, are killed in the battle with the Headless Monks, along with a young woman, Lorna Bucket, who died because she wanted so desperately to see the Doctor again. These things would tear the Doctor apart on the best days, but when his non-violent victory turns into a horrible bloodbath, it’s even more devastating. Most of all, it’s the fear in Amy’s eyes after her baby turns out to be a Ganger that sobers the Doctor. Amy can deny it, but in that moment, she is afraid of the Doctor; it’s the first time he hasn’t come through for her. Losing someone’s trust, especially his best friend’s, is more than the Doctor can handle. After surveying the fallout, we see a Doctor who is utterly lost, without a plan or any sort of direction; we almost never see the Doctor this out of control, and I don’t think River oversold it when she called Demon’s Run his darkest hour. Throughout the episode, Matt Smith was at his absolute best, playing the jovial moments – such as his reunion with the Ponds – and the dark ones – his confrontation with River – equally well. There is so much power to this performance, and Smith elevates the already-exceptional material to greater heights. Just look at the “Colonel Runaway” scene, where the Doctor mocks the evil military leader. It starts as a bit of lighthearted showmanship, then descends down a darker path as we see the true depths of the Doctor’s rage. The Eleventh Doctor is known for his humor and quirky nature, but Smith can play these dark moments just as effectively. I don’t think we’ve ever seen the Doctor so angry in the revived series; David Tennant liked to shout a lot, for instance, but Smith’s anger, comparatively subtle, is far more palpable. The Doctor was also faced with the reality of his own image at several points throughout the hour, providing more shining moments for Smith to play. First, he learned that Kovarian views him as a “weapon,” and is utterly befuddled at the classification, especially when riding the high of his non-violent victory. Later on, River arrives and blames the Doctor for his defeat, telling him that the fear he inspires in others led to this downfall. It seems like an incredibly harsh thing for River to say, but it’s not without merit; I suspect the second half of the season will flesh out this idea a bit more, but for now, I think River is talking more about the Doctor’s reputation than his motivations. He is the best of men, but he can’t stop himself from saving the day every time, and his constant success has made him more powerful than any man should be; he’s created enough enemies that a day like Demon’s Run was inevitable, and River, who seemingly knows him better than anyone else, has realized this. Smith’s body-language during the sequence says more than words do – clearly, the Doctor is angry to hear River say this, but during River and Kovarian’s speeches about his darker side, you can see little hints that this idea isn’t entirely foreign to him. Even subconsciously, the Doctor sees the validity in these statements, and it will be very interesting to see how the Doctor acts in the second half of series six. He certainly doesn’t end the episode in a dark place. Upon learning River’s identity, he’s positively jubilant, the happiest we’ve seen him in a very long time. The Doctor clearly knows more than we do, but I think much of his happiness simply comes from finding another Time Lord (or, more accurately, a revived breed of Time Lord). Before, the Doctor was terrified at the thought of romantic relations with River, but once he learns who she is, he seems excited at the prospect, and rushes off to ‘meet’ her without a moment’s hesitation. Again, Smith is being asked to convey a lot without words, yet he plays the scene so beautifully that it’s impossible not to be excited about where the Doctor is headed, and what he’ll do once he gets there. The same can be said of the show itself. This first half of series six has drawn to a close in spectacular fashion, and while there are still many balls up in the air, A Good Man Goes to War brought enough closure to certain aspects of the story to keep me satisfied over the summer. It revealed exactly what this first batch of episodes was all about, and more importantly, gave us a firm direction for the next part of the story. There’s a lot left to see – the Doctor is still going to die in the future, we still don’t know why River is in prison, the Silence have to return to blow up the TARDIS, we haven’t learned about Kovarian’s goals or associations, etc. Yet watching the Doctor jump in the TARDIS and head for, perhaps, his life’s grandest adventure is enough for now. This was a largely excellent start to the season, and knowing Steven Moffat and company, it can only get better from here. --Of all the unexplained things in tonight’s episode, soldier Lorna Bucket was the biggest enigma. Like River, she’s someone from the Doctor’s future, someone who met the Doctor as a young girl. She comes from a “Gamma Forest,” and their translation of the name “Melody Pond” is the one we’re all familiar with (explaining why the TARDIS told the Doctor “the only water in the forest is the river” back in The Doctor’s Wife). I assume we’ll see the Doctor visit this Gamma forest in the future and meet Lorna as a young woman in the second half of the season. --When the Doctor gives his ‘cot’ to Melody, I wonder if he was entirely truthful in saying it was his as a baby. The Doctor hesitated before telling Amy and Rory where it came from, and I wonder if the implication is that this cot actually belonged to one of the Doctor’s children. We know he had kids many centuries ago on Gallifrey (his first companion was his granddaughter, Susan), and they presumably died along with the rest of his species in the Time War. Did Melody’s presence open up some old wounds for the Doctor? --While we didn’t learn a whole lot about Amy’s kidnapping tonight or how the Doctor learned the Ganger was a fake, the Doctor did say that Amy was likely switched with the Ganger “before America,” i.e. before the beginning of the season. As I said last week, this was entirely possible, and it makes the most sense to me. It makes the kidnapping all the more unsettling, though, since it means we didn’t see the ‘real’ Amy Pond until the end of last week. Hopefully some of the gaps will be filled in during the second half of the season. --In an hour with many memorable moments, the pre-credits sequence was one of the best, as Amy passionate speech turned out to be not about the Doctor, but about Rory; Moffat used the audience’s familiarity of speeches about the Doctor to trick us, then to highlight how similar Rory and the Doctor are in their bravery and determination. Rory has been used really well this year, and I hope we get plenty more from Arthur Darvill not just in the next batch of episodes, but in the seasons to come. I know it’s customary for the Doctor to have a revolving door of companions, but I’d be fine with Amy and Rory sticking around until this Doctor regenerates. I can’t imagine Smith without Gillan and Darvill at this point, and quite frankly, I don’t want to. COMING SOON: The sixth series returns to BBC America next Saturday, August 27th, and I will have new reviews up for each episode of the season when they air! But before that, come back this Wednesday, August 24th, for a retrospective of the first half of series six!